You know I am on a sequin shaker card roll, so here is one more (surely not the last though). 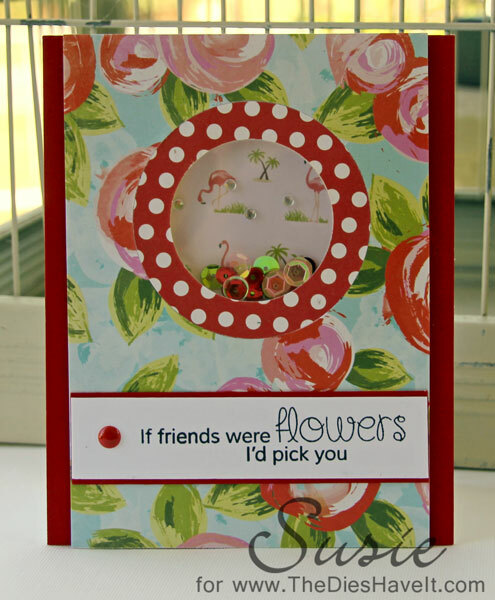 These shaker cards are so much fun to make and they are so simple considering the punch they pack. This one is completely flat on the front so I built the shaker on the back and then popped up the patterned paper. I think this is my favorite way to make them now. Have you been bitten by the sequin shaker trend? I can't deny I have!! See you tomorrow for Color Throwdown. there's a flamingo in there - I love flamingoes. ack! and a shaker! my heart be still.